A barrier-Free entrance and barrier-free seating for graduates, guests, and faculty/staff marchers is provided on the lower level of the Sports Arena. Guests requiring barrier-free access should enter the arena at the doors closest to the parking lot (signs will direct you). Once you enter, an usher will direct you to seating. Please arrive as early as possible for your ceremony. ►Doors open for guests at 8 a.m. for the 9 a.m. Baccalaureate ceremony (School of Education, School of the Professions, University College). ►Doors open for guests at 12 p.m. for the 1 p.m. Baccalaureate ceremony (School of Arts and Humanities & School of Natural and Social Sciences). ►Doors open for guests at 4 p.m. for the 5 p.m. Master's/C.A.S. ceremony. A hearing interpreter will sign each ceremony and be seated on stage. Graduates or guests who require a hearing interpreter can request special seating arrangements by e-mailing the Events Management Office, or call (716) 878-6114. Assistive listening devices may be signed out on Commencement day at the information booth located outside the Sports Arena. Large-print copies of the commemorative program will be available upon request. 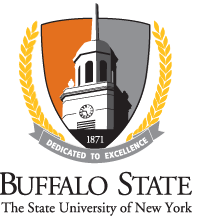 Please e-mail the Events Management Office or call (716) 878-6114 if you would like a copy for Commencement day, or ask an usher that day. You also may contact the office anytime after Commencement to request a large-print program. Shuttle van service begins at 7:30 a.m. transporting guests from Cleveland Circle to the Sports Arena vicinity for those who require assistance. This service will run to the end of the 5 p.m. ceremony. Signage will direct you.